I recently returned from a wonderful trip to Kenya. Aside from seeing old friends, I had the pleasure of meeting with key members of the media along with prominent peace organizations to brainstorm how violence could be prevented in the lead up to elections. Many thanks to Global Partnership For The Prevention Of Armed Conflict for inviting me to discuss my thoughts on how technology and messaging could be leveraged towards this cause. The growth of Kenya is visible throughout the capital. Buildings were under construction all around and the Chinese are investing in infrastructure and building roads. And while the birth rate is extremely high, the government is also the 12th highest education spender compared to GDP in the world. Things appear on the up and up. 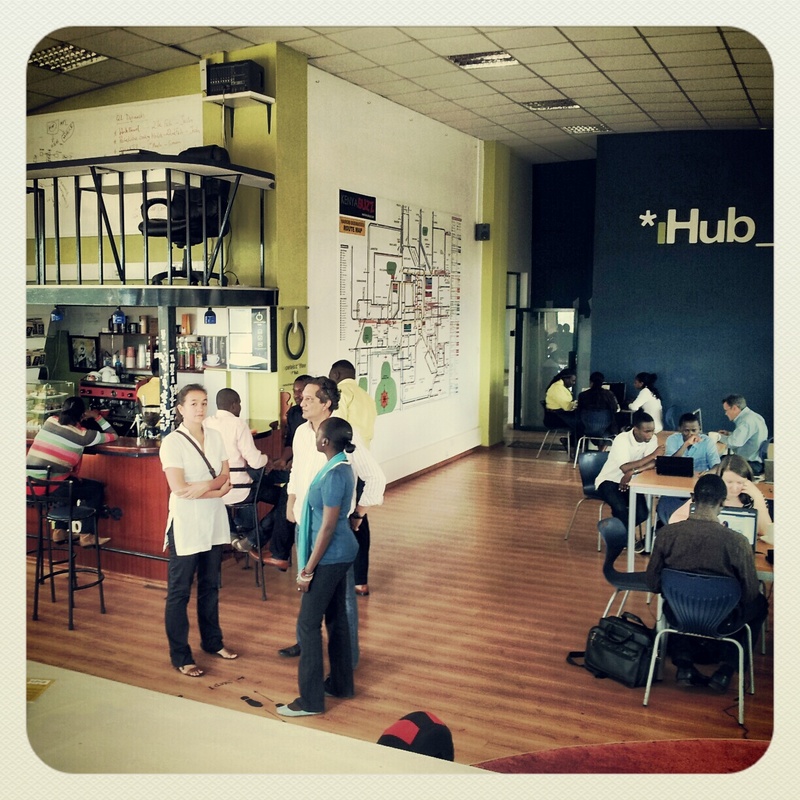 iHub Nairobi. Coffee to the left. Hackers to the right. A shining example of the successful education was found in the iHub. A place I’d heard much about, it was a pleasure to finally visit this cool co-working space. For one, I wanted to get there because Pete’s Coffee shop is housed inside and it is without a doubt the best cup of java in Kenya. Pete even has the medal for best barista in Nairobi to prove it. As the home of Ushahidi and other local tech startups, it houses some pretty impressive minds, as well as infrastructure to keep those minds occupied and producing. As the center expands, new areas have emerged including iHub research and the m:lab East Africa, focused on mobiles. The whole area was decked out in necessary elements for creativity: comfortable chairs, a good view, geeky wallpaper, bottomless caffeine, a foosball table, and good company. The m:lab also has a creative feature, a glass room with every kind of mobile device imaginable. In a country where 99% of internet access comes from mobile, it’s most important to understand that new projects are supported on the devices that average people have in their hands. From basic Nokias to Blackberries to Android Tablets, startups can rent the room, test their tool on the devices and tweak their products accordingly. Cross browser testing has been available for some time through websites like Browsershots, but I’ve been surprised to see a lack of comparable service in the mobile arena. This shop provides a hands on alternative, but I imagine that the growing global proliferation of Android phones with their varying screen sizes and operating systems is going to mean an expansion for the need for an expansion of these type services here and elsewhere. 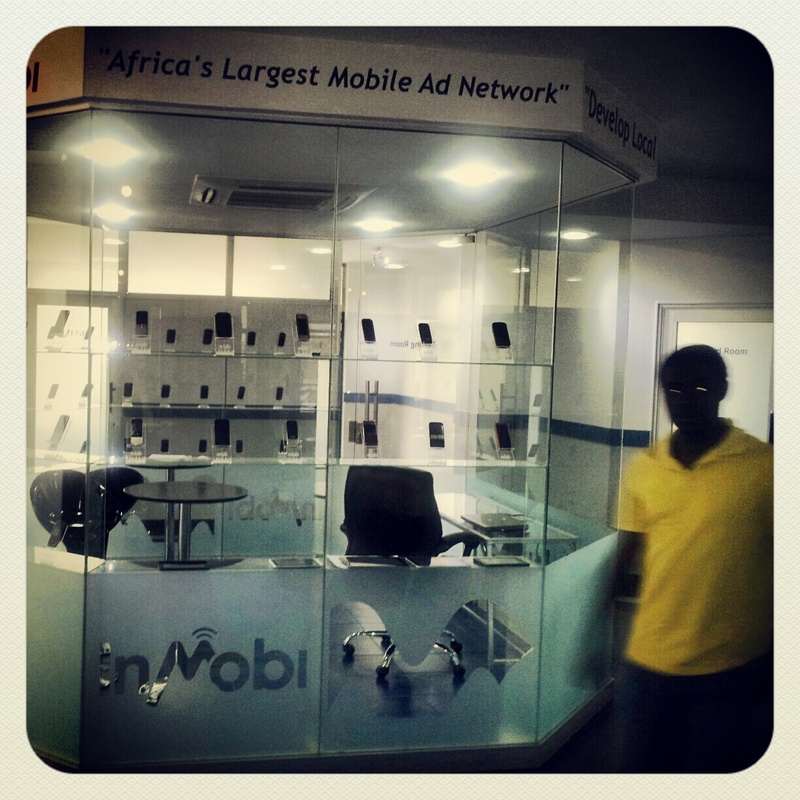 m:lab East Africa mobile testing area. Kibera, known as the world’s largest slum, was a stunning contrast to the development seen all over the rest of Nairobi. The stark poverty of corrugated tin shacks cramped together with little organized sanitation came as a surprise insofar as its close proximity to main district. Always nearby, but out of sight, it comes as a shock to suddenly enter this city within a city. 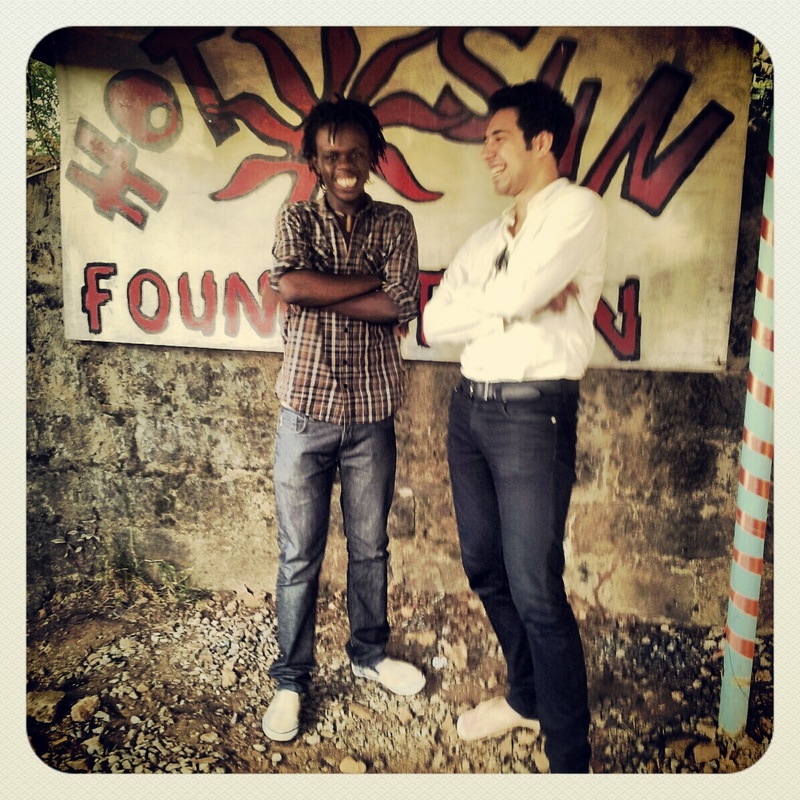 Laughing with Josphat of Hot Sun Films at their offices in Kibera. Yet innovation is alive here as well from projects like MapKibera to the group I had set out to meet, Hot Sun Films. My colleague Tegan Bukowski had done a photo project thanks to their help with children sharing their stories as part of Digital Democracy‘s We are Peace (Sisi Ni Amani) initiative for crowdsourced peacebuilding. In dropping off large format paper versions of their digital photographs for the kids, I was given a tour of their facilities. Several Mac editing bays sat under graffitied walls. A Red camera along with other equipment stacks the equipment closet. Here are passionate youth making media about life in Kibera, but also reinventing filmmaking as a sustainable profession for the underprivileged. After sitting through a boring donor film that they had made, they put on an incredibly well done trailer for a new film, Togetherness Supreme, that was all shot, written and edited by locals and an American director. Yet this is not Nigeria and creating a Nollywood in Kenya is still a ways off. Whether the skills being developed here can actually be turned into paying jobs remains to be seen, but I’m hopeful that locally created film content can create a new opportunity for these youth to sustain and even perhaps thrive. SMS continues to be used in unique and interesting ways given that an estimated 70% of the population now participates in m-Pesa mobile banking from their phones. Users can even SMS with a doctor for consultation with Daktari 1525. And tools like Twitter are leveraging SMS as networked communication for people who don’t even have internet access. One of my favorite examples of innovations in governance has a local governor, @chiefkariuki, signing up his constituents on a mobile SMS-only version of Twitter so that they can send him reports, comments, and issues more affordably and so that he can respond to his 20,000+ followers phones quickly through one simple message. And those constituents who don’t have access to electricity have figured out how to charge their phones by converting power from car batteries. It seems that wherever one looks, innovation abounds. Yet corruption still rears its head and prevents progress from happening. Projects like the Kenya Open Data Initiative are stifled from accessible data that unfortunately doesn’t match the on the ground realities of places outside of the capitol. Some indicators of progress and innovation are clearly manipulated. And the visible campaigns against corruption, from parking aids uniforms to signs outside the University of Nairobi, show that it’s indeed a problem, though something is being done about it. Budget 2010 to 2011 recurrent plus development via OpenData Kenya. In my opinion, it’s not corruption but fear that is holding back the country. There is a large and ineffective security apparatus that slows the country down to a grind. I asked my friend Erik Hersman why he rides his motorcycle to work and whether that was dangerous. He basically laughed off the premise, explaining that Nairobi traffic doesn’t usually move, making it easy and safe for him to navigate. While partially an infrastructure problem, one notices that trying to get into parking lots, office buildings and the like, that security guards check car trunks and use mirrors to investigate undercarriages for bombs. Walking into office buildings means getting scanned by a metal detector and more often than not, being asked what is in ones bag, rather than them actually checking. Kenyan soldiers have been fighting the al-Shabab in Somalia under an almost total media blackout and resulting in an increase of terror attacks in Kenya. A few days after I left, a grenade was thrown at a bus station, killing many. Instead of making Kenyans safer, the security apparatus increases fear and slows down the type of progress and innovation that has been beneficial to all Kenyans. 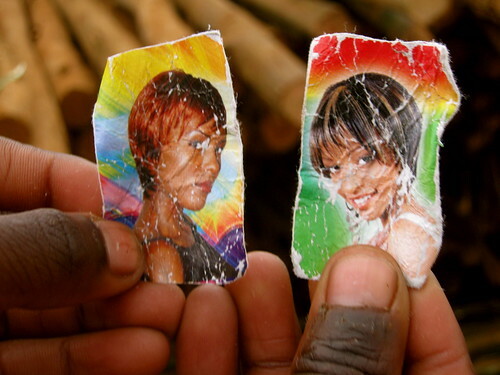 Photo taken by an 11 year old youth living in Kibera as part of the Kibera Photo Project. Click to see more of their photos. The worry is what the fear and lack of stability will do come elections. The last round of elections brought violence. Since then, a new federalist constitution was voted in which its to, in part, prevent further violence from occurring, but is in fact likely to do the opposite. With hundreds of people on the ballot and a more confusing tiered system of governance, there is ample room for confusion and manipulation. And with al-Shabab mobilized to destabilize the country at any cost, there is potentially a powder keg waiting to ignite. To make things worse, Kenya just struck oil. As the middle class grows, there is a chance for a groundswell movement of Kenyans, for Kenyans to emerge and sustain peace and innovation in their country. It won’t use “peace” as its rallying cry nor will politicians be at the helm, but I’m interested to see how the groups I spoke with, or perhaps others, will develop a strategy to combat the difficult situation that they’re in. Already, creative solutions are emerging as with this anonymous graffiti that was left on the wall near the largest market in downtown Nairobi. It speaks so loudly that it can’t be painted over. I don’t doubt that more innovative methods will be developed. I only worry that they won’t have the support, scale, or coordination to prevent what’s currently inevitable. 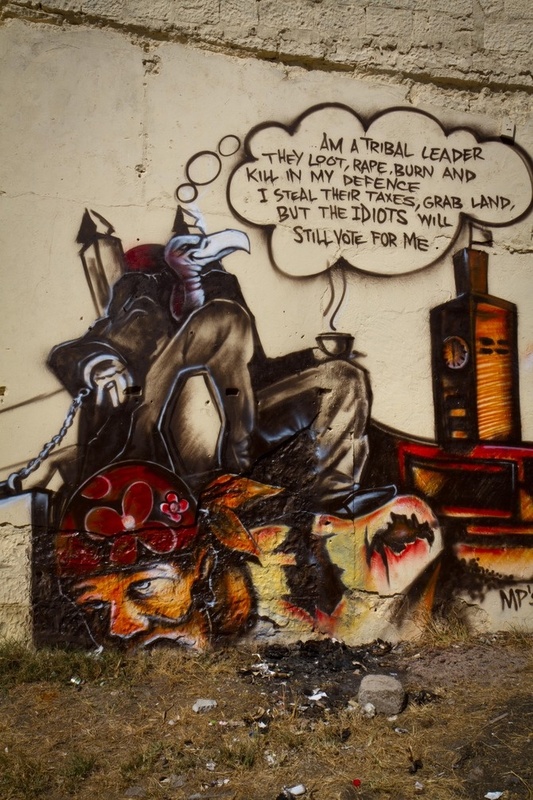 Graffiti on the wall of the main market in downtown Nairobi. With the tribe that he descends from firmly in the minority, will their be a chance for unity in the US or in Kenya in 2012. Time will tell. 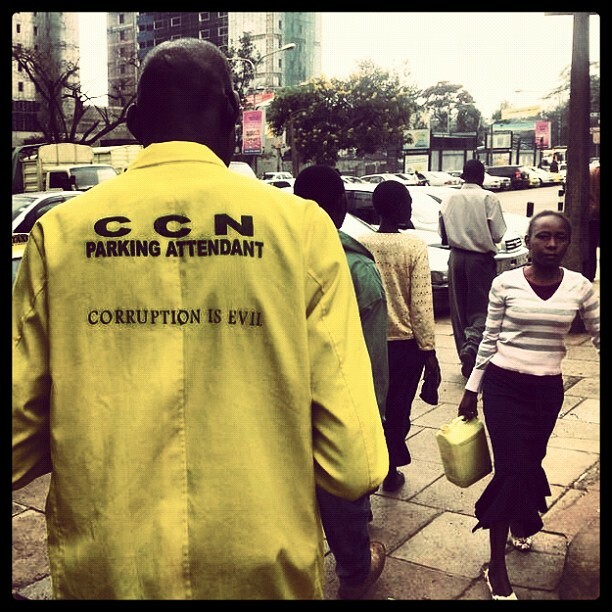 Even the parking attendants are battling “evil” corruption.